Archiving candidate profiles is similar to making their profiles inactive temporarily. They are there in your account but are in an inactive state. You can restore these profiles at any time you prefer. Click on the desired candidate profile on the Candidate List page. This will open the Candidate Profile. You can also archive candidates from the Candidate List page. 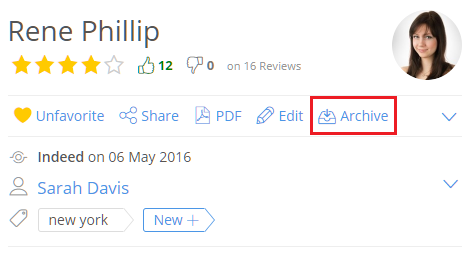 Select the desired candidate and click on the Archive button on the action bar. When a Candidate is archived, you will not be able to add that candidate to any Job or take any action on such candidate profiles. However, all this data is safe and at your disposal when you wish to restore it. With Jobsoid, you never have to "Delete" any Candidate unless you have created it in error or duplicate. There is no limit on Archived Candidates. To View archived candidates, kindly toggle the "Show Archived" switch on the Candidate list page to ON. Click on the desired candidate name. This will open the candidate profile. Click on Restore button in the Action bar. It is present just below the candidate name. A dialog box asking you whether you are sure about restoring the candidate profile will appear. Click on Restore button. The candidate profile will be restored and shown in the Candidate List.